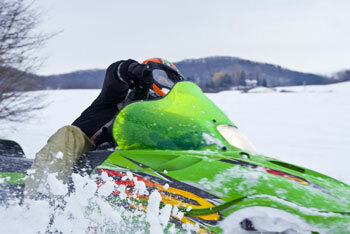 When the snow flies in Oceana County, there's no need to stay indoors. With all the wide open spaces and the abundance of natural resources, there are plenty of outdoor activities to keep you fit, busy, and happy throughout the winter. Located south of Pentwater off Wayne Road in the Pere Marquette State Forest, Pentwater Pathway offers cross country ski enthusiasts and snowshoers 7.2 miles of trails that form four loops. It is under the care of the Michigan Wildlife Division of the DNR and the Oceana Cross Country Ski Association and is groomed regularly. No motorized vehicles are allowed on the trails, and those who snowshoe are requested to travel beside the trails. The paths are wide with a flat to moderate grade. During the summer the William-Field Memorial Train is filled with bikers and hikers, but in the winter the cross country skiers and snowmobilers take over! At 22.5 miles long, the trail opened in 1991 and is extremely popular with people of all ages. It features restrooms, benches, and picnic tables along the way, along with the beautiful, scenic countryside. The entire trail is accessible, and once 4+ inches of snow hit the trail, it is considered quite safe for snowmobiles due to its relatively flat landscape. The trail runs through the communities of Hart, Shelby, New Era, Rothbury, Montague, and Whitehall. 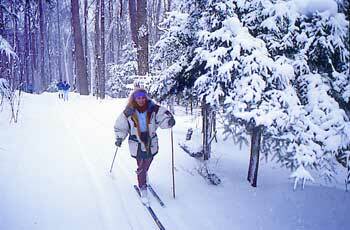 Within the Huron-Manistee National Forest is Crystal Valley Trail, nine miles of cross country ski trails. Located just northeast of Hart, there are four loops, all groomed regularly, with loops three and four a bit more challenging. These trail are used primarily for cross country skiing...no horses, bikes, or motorized vehicles are allowed, and snowshoers are asked to walk beside the trails. These trails are also maintained by the Oceana Cross Country Ski Association. 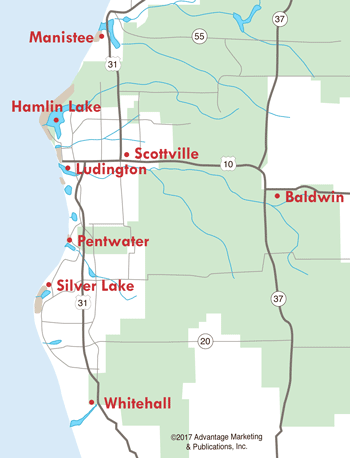 The combination of fresh, cold air and the beauty of this region makes it a perfect time to enjoy the great outdoors in Oceana County.